Squamous Cell Carcinoma (SCC) is the second most common skin cancer, after the cancer subtype of basal cell carcinoma. SCC occurs most frequently on sun-exposed regions of the body. Early detection and treatment are a requisite to prevent destruction of surrounding tissues, and prevention of spread beyond the skin. 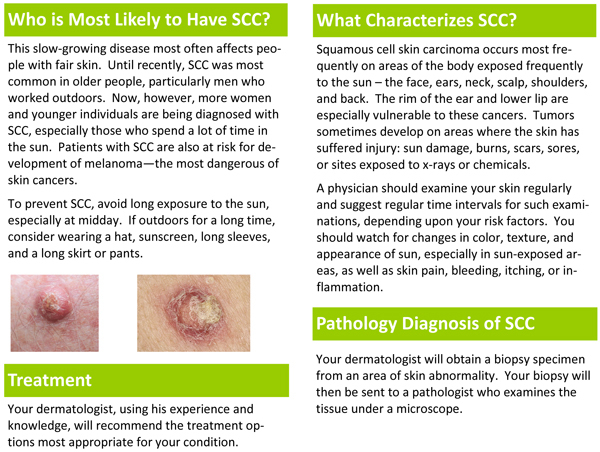 Common characteristics of SCC include a bleeding or non-healing sore, a reddish patch, or an elevated/wart-like growth. Actinic keratosis, a precursor lesion caused by sun damage, can develop into squamous cell skin carcinoma.